Is Resistance to Change Rational or Irrational? My personality type is called a Rational. That doesn't mean I'm always rational ... just watch a few discussions with some of my family members that know how to push my buttons and you'll see the irrational side of me rise to the surface. 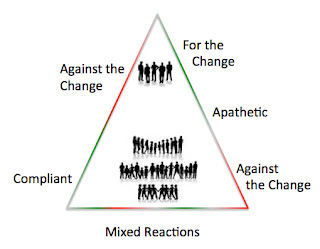 In the same way, resistance to change can be rational and irrational, depending on the person and the circumstances. Take a look at the following stereotypical organizational going through change. In the stereotype, a small group at the top of the organization creates the change. 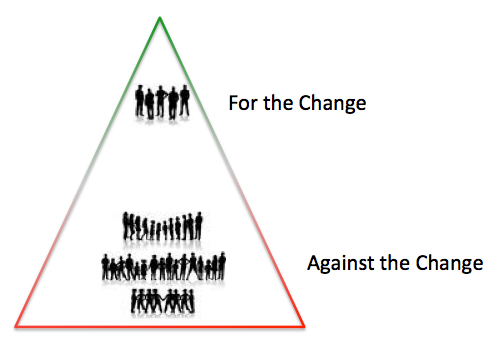 The large group at the bottom of the organization resists that change. People support what they help create, so it does make sense that the smaller group is for the change, if they created the change together. "Contrary to commonly held beliefs about resistance to change, results from this study demonstrated that individual resistance to change does not have any relationship to commitment to change." I've often thought of resistance to change and commitment to change as a continuum. Researchers in the past decade have shown that resistance to change is more complex than a simple "right" or "wrong" dichotomy. Foster, R. D. (2010). Resistance, justice, and commitment to change. Human Resource Development Quarterly, 21(1), 3-39.